Most of us use chronologies in our ancestral research–consider making a resume for your ancestor. List what years he worked what jobs. Census and city directories are great ways to start getting this information, but death certifiates, obituaries, estate inventories, etc. all may give occupational clues. 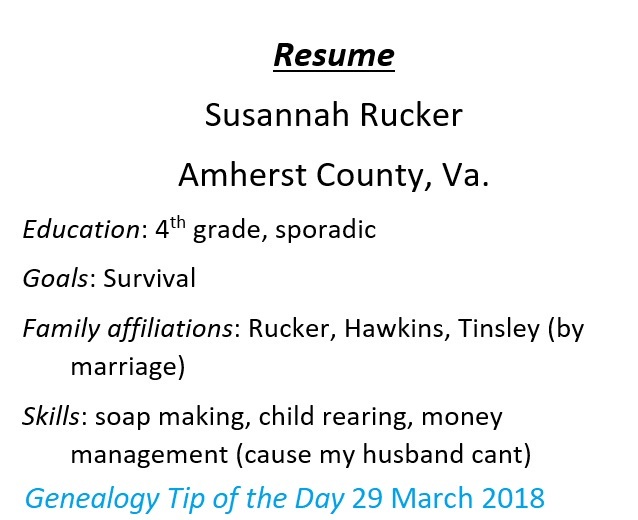 Don’t pad your ancestral resume like you might your own. Stick to documentable facts (grin!). I think that’s a wonderful idea. I can see doing one for my grandmother. I also see why u would do it. Thank you! Ha Ha Your resume was funny!